A wide array of professional training opportunities for all members developed with an eye to accessibility and affordability. Business basics courses are offered at exclusive prices to TFG Companies members. A regular on-going publicity campaign about Guild events and that includes both traditional and social media, and active outreach to architects, engineers, general contractors, and building owners - the end-users who make buying decisions. We provide TFG Companies with a platform for in-person and distance networking opportunities with peers and industry leaders. TFG Companies Principles of Practice identifies Company Members’ responsibilities to the public and clients you serve; to help shape the quality and integrity of buildings; and to the craft, technology, and business of timber frame construction. LISTING ON FIND A TFG COMPANY: This sophisticated search tool on TFGuild.org combined with your profile page directs customers to your website, improves your SEO and puts leads in your inbox. BUSINESS DOCUMENT LIBRARY ACCESS: In recent years, TFG Companies have worked together to build a collection of basic business documents: contracts, safety plans, personnel manuals, etc. MEMBER DISCOUNTS FOR YOUR TEAM: Register your staff members for conferences, workshops, and tours and TFG member rates. 1 FREE ATTENDANCE TO BUSINESS BOOTCAMP: Normally $175, this day-long intensive workshop addresses pertinent business-related issues, suitable for beginner and veteran alike. 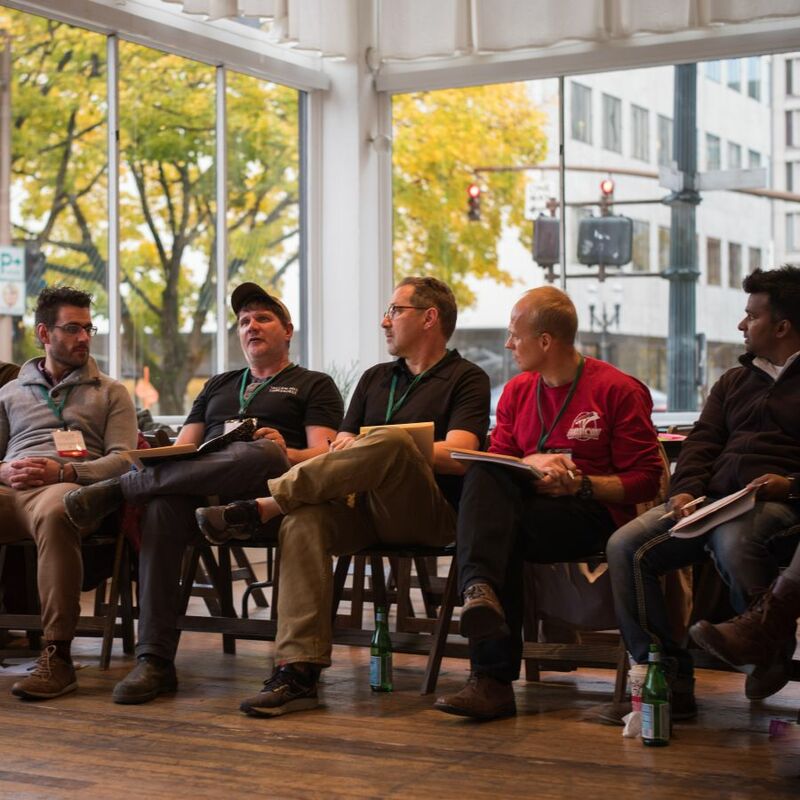 Business bootcamps are offered as a pre-conference event at national conferences. DISCOUNTED MEMBERSHIP BUNDLES 25% discount on bundles of 5 digital memberships, 15% discount on bundles of 5 traditional memberships. Share them with employees, vendors, or customers. ENGAGE LOCAL ARCHITECTS: TFG authors material sanctioned by the American Institute of Architects (AIA). After a brief training, your company will be eligible to present this TFG endorsed, CEU-eligible material to architects in your area. STEERING COMMITTEE ELIGIBILITY: You can serve and help shape the future of the TFG community. When you enroll as a TFG Company, you are affiliating with the Guild’s 30-year history and exciting present. Not only does your membership support the Guild’s expanding mission, but it yields credibility, opportunity, and connection for your business. 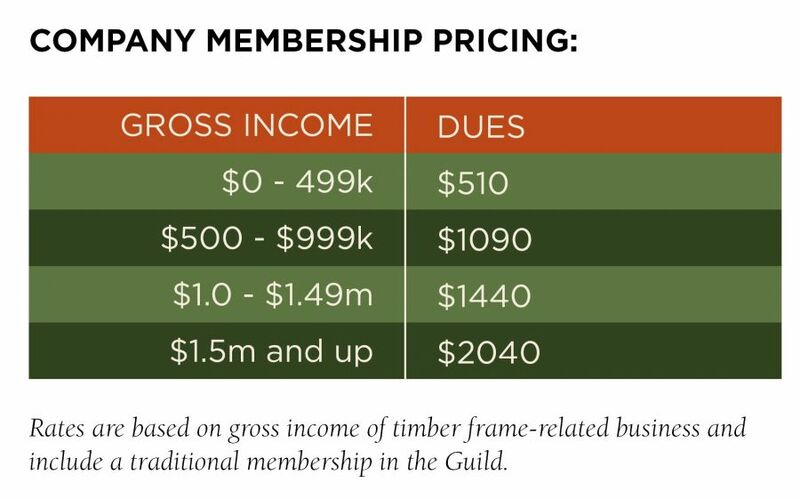 TFG also assists Guild Companies by offering educational opportunities for developing business skills and creating collective public outreach programs designed to increase awareness – we tell the story of timber framing. Every company, no matter your service or size, can join and receive value from becoming a TFG Company. A wider array of professional training opportunities for hands-on timber framers developed with an eye to accessibility and affordability. One thing is clear—your membership and participation provides the resources for the Guild to carry out this mission. Click HERE to see the benefits you receive when you join TFG Companies. The interest of Timber Framing companies and their suppliers.